If you would like to list your pickleball tournament here for free then just send me an email at mroberts@virginiapickleball.org and I will list it including your registration form. If you are planning a tournament I have left the 2017 tournaments listed so you can look and see if your tournament date might conflict with other tournaments. If you would like to receive email updates whenever a pickleball tournament is announced in Virginia please click here and subscribe. 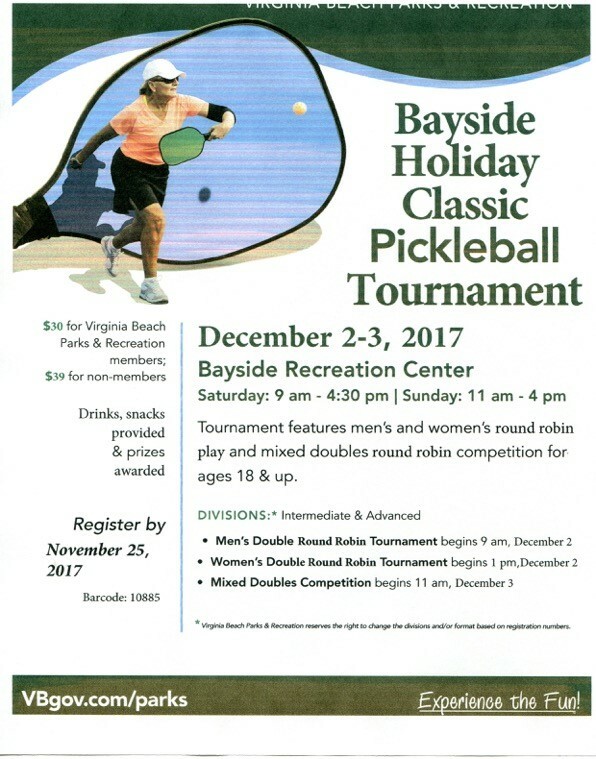 2018 Virginia Beach Holiday Classic Pickleball Tournament will be held Dec. 8 and 9. Registration will start in September. Shamrock/Veteran’s Day 3.0 and under skill level only – no age limit. Cost: $35 for each event and $15 for each additional category. Social Dinner: Thursday November 8th at 6pm. Buffet dinner, open bar and dance music. Registration at PickleballTournaments.com Click here to register. This is a non-sanctioned tournament. Medal round matches will have referees.  $30.00/pp – $10/pp for additional division.  Deadline to register: Monday, June 16, 2018. No postmarks.  Round Robin into bracket play. Top 3 teams receive awards.  Non-sanctioned, self officiated. Matches will be governed by USAPA rules.  Schedule posted by Monday, July 16, 2018. Click here for flyer. Click here for registration. Send email to barrett.worthington@gmail.com to sign up! Open, skill, and senior divisions. For more information, contact Parks and Recreation at 804-556-5954. Location is SML YMCA, 293 Firstwatch Dr., Moneta, VA 24121. Players may only play in one age division in the same event. EVENTS: Round Robin Format, Men’s, Women’s and Mixed Doubles. COST: $30 for one event and $15 for additional category. All players must present photo ID upon check-in. ENTRY DEADLINE: October 22, 2017. No late registrations will be accepted. No refunds.  Non-sanctioned, self officiated. Matches governed by USAPA rules.  Men’s, Women’s & Mixed Doubles by skill rating.  Round Robin into bracket play.  Top 3 teams receive awards. Click here for info and registration. REGISTRATION IS FULL! Link to information and registration, click here. The CSA Pickleball tournament returns for another year of competitive pickleball in Chesterfield County! The tournament will feature a double elimination format with matches consisting of a single game played to 15 points. Competition will be held in a variety of categories, including both doubles and singles play as well as senior and open divisions (senior must be 55+). Competition will last all day. Refreshments will be served. Registration must be completed online and each player must register individually. Meet and compete against players from the Mid-Atlantic region and beyond. Over 60 players from 9 states have already registered for this exciting weekend of junior (new), men’s and women’s doubles and mixed doubles play located minutes from our nation’s capitol! Register Now! Don’t be left out. Registration closes on August 31. Need a place to stay? 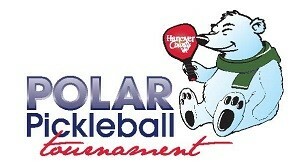 Look for soon to-be-posted tournament hotel information on our pickleballtournaments.com welcome page. See you on September 30-October 1. Organized by Breakthrough Community Sports, Inc., a 501 (c)3 organization promoting active aging through playing sports. 60+ Open Age Bracket. Must be 60 by the end of the year to qualify. Information and registration form click here.  Boxed lunch and water will be provided. registered. Tournament format subject to change based on the number of participants. Questions: call Justin Bullock at (540) 967-4420. Registration fee will include a boxed lunch from Subway!!! Come join us on the courts for Goochland Parks, Recreation & Facilities Pickleball Tournament! ere will be an open-doubles and senior-doubles division. Players are guaranteed 3 games. Drinks and snacks will be provided. Tournament format subject to change due to registration. Mark your calendar! Register early…space is limited! Deadline is March 31st, 2017! $15 per person. Contact the Recreation Team at 804.556.5884 for more information. Fee includes lunch on Saturday and play in two divisions. March. Specific dates and registration forms to come. For more information, contact Tim A. Ray, recreation specialist. 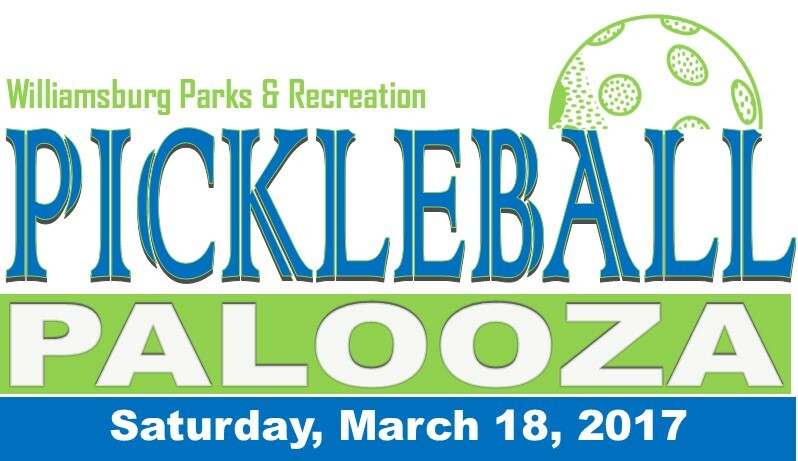 March 18th, 2017, Williamsburg Parks and Rec Pickleball Palooza!  Top 3 teams in each division receive awards. When: Practice: Wednesday, March 22, 6:30-8:30 p.m. Entry Deadline: Fees Due by 5 p.m., on Wednesday, March 15, 2017. 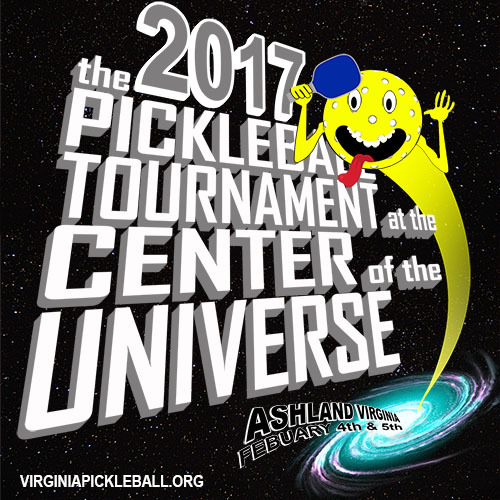 The 4th Annual Pickleball Tournament at the Center of the Universe Returns!